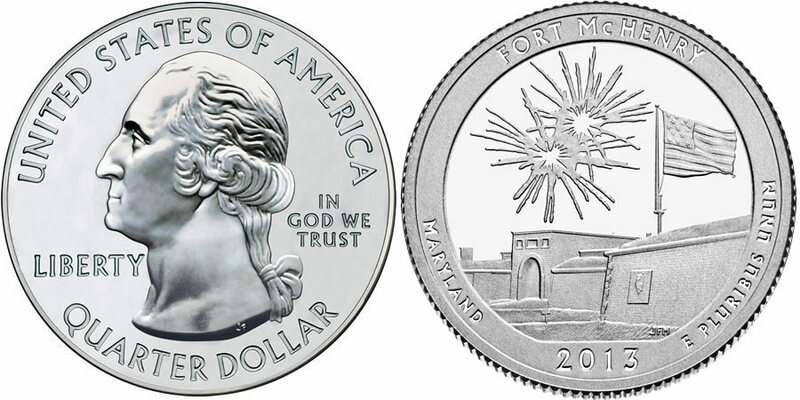 Offered by the United States Mint in 2013 as the fourth release that year of the America the Beautiful Quarters® Program is the 2013 Fort McHenry National Monument and Historic Shrine Quarter. A design located on the reverse of the strike is emblematic of Fort McHenry National Monument and Historic Shrine located in Maryland. That design is also featured on two other US Mint series. This includes the America the Beautiful Silver Bullion Coins™ and the America the Beautiful Five Ounce Silver Uncirculated Coins™. Unlike the associated quarters which are typically struck from a clad composition, both of these other two series are struck from five ounces of .999 fine silver to a diameter of three inches. The America the Beautiful Bullion Coins were authorized by Congress along with the quarters under Public Law 110-456 (America's Beautiful National Parks Quarter Dollar Coin Act of 2008). The five ounce uncirculated coins were created as the numismatic versions of the bullion coins under the power granted to the Secretary of the Treasury. Fort McHenry National Monument and Historic Shrine of Maryland preserves the location of Fort McHenry. While it served the nation on many occasions, it is probably best remembered as the location featured in the Star-Spangled Banner (the national anthem of the United States) written by Francis Scott Key. All America the Beautiful related coins (quarters, five ounce bullion and five ounce uncirculated) feature the same obverse portrait of George Washington. The portrait of the first President of the United States was designed by John Flanagan. Obverse inscriptions include UNITED STATES OF AMERICA, QUARTER DOLLAR, LIBERTY, IN GOD WE TRUST and the mintmark. On the reverse of the coin is the design emblematic of Fort McHenry National Monument and Historic Shrine. Reverse inscriptions include FORT MCHENRY, MARYLAND, 2013 and E PLURIBUS UNUM.